We are loving this warmer weather! Two major benefits of spring are getting extra exercise outside & craving light, fresh, healthy food vs. the heavy winter comfort foods. Nothing says Spring like a beautiful salad for dinner! 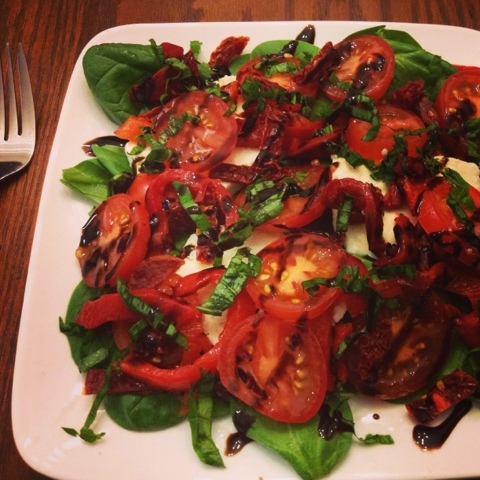 Tonight we're making a fresh tomato Caprese salad with roasted red peppers, sundried tomatoes and fresh basil. We topped our salad with grilled balsamic chicken but this would be just as delicious meat free as a vegetarian option. Drizzle with a touch of heart healthy extra virgin olive oil and finish off with balsamic vinegar. Hope you enjoy this simple & delicious summer salad! 1. Add 1 tsp of olive oil to grill pan and heat to medium high heat. Season chicken with salt & pepper and grill for 4-5 minutes on each side until cooked through. Before removing chicken, add 1 tbsp balsamic vinegar to pan and flip chicken to glaze. Remove from pan and slice on an angle. 2. Slice roasted peppers, tomatoes & fresh mozzerella, halve sundried tomatoes and thinly slice basil leaves. 3. 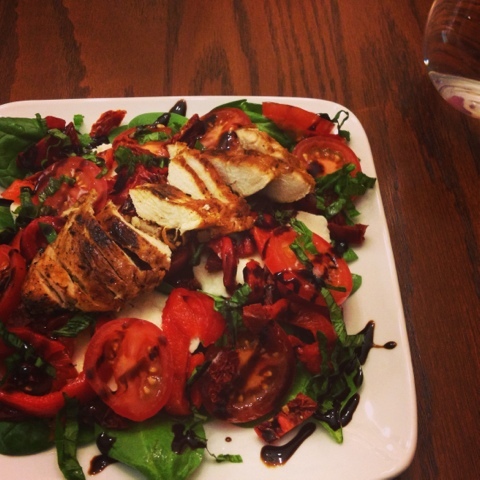 Plate up a bed of spinach and top with mozzerella, tomatoes, red peppers, sundried tomatoes, basil and chicken. 4. Drizzle each salad with one tsp of extra virgin olive oil and two tbsp of vinegar to finish. Love salads with grilled chicken. Love your blog! New follower through bloglovin. Found ya through TGIF Hop. Yummy! I love salads :) Thanks for linking up this post to The Best Blog Recipe’s Weekend re-Treat #12!